Reliable Controls is pleased to announce a new product called the "End Of Line Terminator". Many third-party BACnet® integrations require a connection to Reliable Controls MS/TP devices, and it has become increasingly evident that many of these third-party devices do not come with built-in end-of-line terminators. As a result, these third-party devices sometimes function as the physical end; but have no means to terminate. After listening to its Authorized Dealer network, Reliable Controls has created a solution to this growing problem. 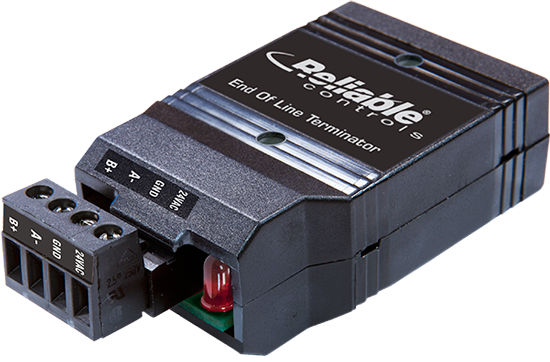 The Reliable Controls End Of Line (EOL) Terminator provides the ability to properly terminate EIA-485 twisted pair networks. The EOL has 24VAC input power and is a biased terminator similar to those found on all of Reliable Controls controllers. The device has a red power LED to indicate the device is powered correctly and comes with convenient mounting screws and removable 5mm rising cage terminal blocks. Visit www.ReliableControls.com/EOL for more information.